There is currently a bill before the U.S. House of Representatives to establish a Department of Peacebuilding. This historic measure will augment our current problem-solving options, providing practical, nonviolent solutions to the problems of domestic and international conflict. The legislation will pass from bill to law under one condition: that a wave of citizen interest rise up from the American people and make itself heard in the halls of Congress. During the 20th Century, over 100 million people lost their lives to war — most of whom were non-combatants. Now, at the dawn of the 21st century, the extent and current speed of nuclear proliferation makes the achievement of non-violent alternatives to war the most urgent need of the human race. Support our military with complementary approaches to peacebuilding. Create and administer a U.S. Peace Academy, acting as a sister organization to the U.S. Military Academy. Join our monthly Department of Peacebuilding Campaign calls on the third Wednesday of each month at 5pm PT / 8pm ET. Call-in information is 1-929-436-2866 or 1-669-900-6833, meeting ID 464 735 321 or Register here. Email [email protected] for more info and to receive monthly email updates and reminders the week before each call or for general inquiries about the campaign — better yet, let her know you’re ready to get to work for more peacebuilding and one of us will speak with you more. 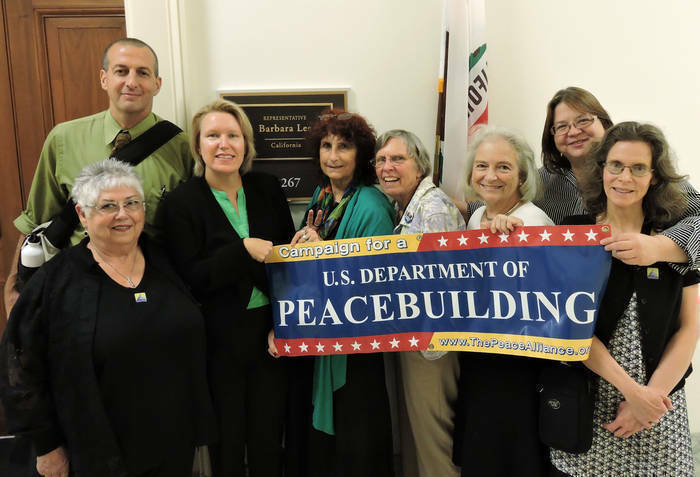 Participate in our initiatives and actions, including: 1) Season for Nonviolence; 2) Mother’s Day “Peace-Wants-A-Piece-of-the-Federal-Budget-Pie” meetings with members of Congress; 3) Annual Department of Peacebuilding Advocacy Days in Washington, DC; 4) Follow-up to Advocacy Days; and 5) Holidays 4 Peace. Help us gain additional organization and prominent individual endorsements of the Department of Peacebuilding legislation. Contact [email protected] for more information. Help us add to our list of city, county and tribal entity endorsers of the Department of Peacebuilding and connect on other city-related peacebuilding efforts. Contact [email protected] for more information. Take Action! Tell Congress to get behind H.R. 1111, legislation to establish a U.S. Dept. of Peacebuilding. If you call, email or otherwise contact your representative in support of a U.S. Department of Peacebuilding, please record your action! Donate to the Department of Peacebuilding Campaign efforts here. Want the Latest News? – Read articles posted on Movers and Shakers!